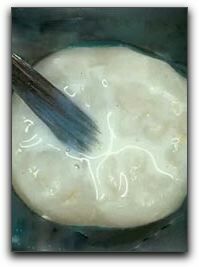 Dental sealants are a thin coat of clear resin that is applied to the biting surfaces of teeth, usually the rear molars. The back teeth are more prone to cavities because is difficult to reach them with a tooth brush and the surfaces contain pits and grooves that easily trap bacteria. It is hard for many adults to clean their back molars and almost impossible for our young The Villages children. Dental sealants fill in the pits and grooves on the rear molars to create a smooth surface. Gainesville family dentists most often recommend sealants for children’s permanent back teeth, though sometimes they are used for adults, too. Ocala parents may not realize how quickly a cavity can form in a young child’s mouth. Many Fort McCoy area kids that we see develop cavities even before they start kindergarten! At Dr. Wayne C. Harper, we take special care of our young Ocala dental patients. We want each child’s dental visits to be pleasant and painless so they will never develop a fear of the dentist. We advise parents on the specific dental issues associated with each stage of childhood. Ask us about fluoride, sports mouthguards, and orthodontic treatment. I am Wayne Harper of Dr. Wayne C. Harper. I don’t believe that childhood cavities are unavoidable. Call my office at 352-867-7181 to schedule an Ocala dental exam.